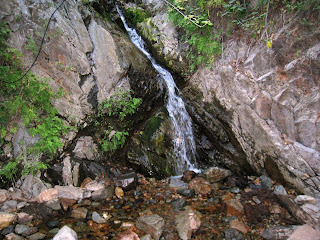 Ashley and I did this hike along with our hike to the top of Saddleback Mountain (Santiago Peak 5,687 feet), but many hikers do Holy Jim Falls as its own independent hike. While we were on the trail, there were several hikers and family's on the trail going to view Holy Jim Falls. This hike is a great outing for the entire family. Holy Jim Falls is one of the most well known hikes in Orange County and it lives up to its reputation of being one of the best. Description of Hike: The trail to the falls is in good condition and on most any day when you go to the falls, you will see someone else hiking on the trail. 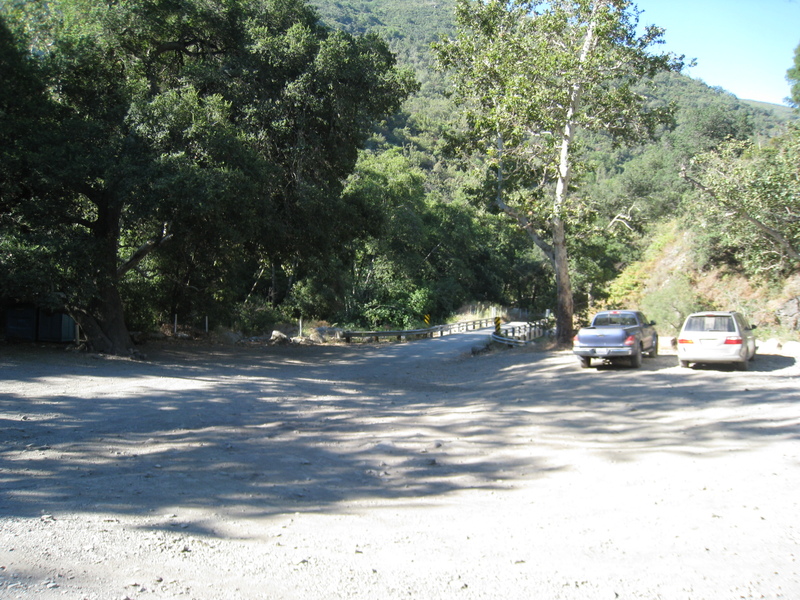 Roundtrip from the trailhead parking lot to the falls is 2.8 miles and it will take you about 1.5 - 2 hours depending on how long you stay at the falls. The elevation gain for this hike is 650 feet. The trail follows the canyon and there is plenty of shade for this hike which will keep the temperatures cool even during the warm summer months. When we went in July there was still water cascading down the falls. The best time of year to see the falls is during the raining season, but during most of the year there is still water at the falls. It is a great hike for beginners as well as seasoned hikers. The waterfall is about 20ft high. 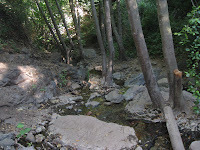 Further Thoughts: The trail starts off in Trabuco Canyon and you have plenty of shade the whole way to the falls. The official trail does not begin at the parking lot. You follow a single lane dirt road through a community of beautiful mountain cabins in Holy Jim Canyon. 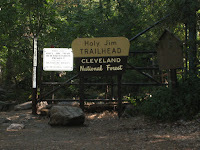 At the last cabin is the official sign that signals the beginning of the Holy Jim Trail. Along the trail you have to cross the stream in a couple of places but unless there has been recent rain it should not be a problem to cross. You might want to bring water proof shoes if you are going during the rainy season. Also be on the lookout for poison oak on this trail. Rating: Elevation Gain: 650 ft. (Easy), Distance: 2.8 Miles Roundtrip (Easy). Thank you Brian and Ashley. We just stumbled on your site. My husband and I hiked to the falls yesterday. 1-21. The bumpy muddy swampy road was an adventure in itself. 4wheelers were having a blast. The trail had plenty of fun little stream crossings. We wondered if there might be another fall up higher. The rainy drizzle was a bonus. Kept us cool and the crowds away. I love your blog. The pictures and information are always spot on, and are perfect for helping us know what to expect before we get there. 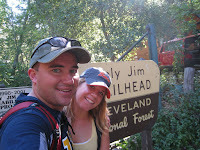 Hiked to Holy Jim Falls last weekend and had a great time. To help pass the time, we counted the river crossings... I'm pretty sure there were 10. Two little girls and baby in a back pack and we all got our shoes a little wet, but we had a great time doing it. Hiked Holy Jim for the first time in 40 years. Still nice but, wish you could have seen it in the 50s & 60s. It has been ruined by over use and urban creep. Did this hike today but parked off Trabuco road and hiked in making it about 9 miles. Hoping to find Trabuco canyon falls on the way in but couldn't locate the trailhead, Holy Jim was very green and beautiful lots of water though the whole creek couple feet deep at the falls base! Thanks for the great site! Hello there! Me and my boyfriend are planning to hike up to the waterfalls. In regards to the adventure pass, is the daily pass okay or should we get the america the beautiful pass? Not exactly sure. Thanks! The day adventure pass is perfect as it is only 5 dollars. The annual adventure pass is 30 dollars, so if you are planning on hiking more than 6 times in our local national forests then this would be your best bet. The america the beautiful pass is 80 dollars but is good at other federal agencies outside of Southern California while the forest adventure pass is good for the national forests in southern California ie: Angeles, Cleveland, Los Padres, and San Bernardino National Forests. Hope that helps! Is this road passable with a Civic? An Impala? We were wanting to hike it this weekend but hadn't seen all the 'negative' reviews of the road on Yelp until just now!! 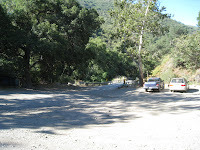 John, we have seen a few cars at the trailhead before, but we will put it this way, we would not do it in our car just due to the risk of bottoming out and scratching the car. We do not want to recommend anything that we would not be comfortable doing ourselves, however, it is possible for a car to make it out there. Hi, could I do this hike with a jogging stroller? Hi Brian and Ashley, I may be an amateur hiker but i just wanted to share our experience today with 2 kids, ages 5 and 9. We did not feel this trail was easy. At least half way through it started to get pretty steep and also a bit slippery near the creek crossings. There were a few times we had to pull our kids up rocks. So in that respect, coming from a parent, I would call this a moderate hike. I would also emphasize just a bit more how long and hard the bumpy dirt road is because its full of rocks and gravel. We have an SUV but still had to navigate around larger rocks and boulders. It took us more than a half hour to go those few miles. We loved the hike but would have skipped it with kids knowing how hard the drive in is. Just some feedback! Thank you for your blog! We have done other hikes because of you and love the information.